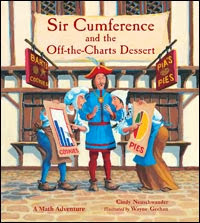 The book I am recommending this week is Sir Cumference and the Off-the-Charts Desserts. (Math) Measurement and Data. Grade 1. Standard 4; Grade 2. Standard 10; Grade 3. Standard 3. (College and Career Readiness) Reading Literature. Grades 1 to 3. Standards 1-7, 9, 10. I will be using this book later this week, hopefully Thursday, as an introduction to our unit on data management. It is perfect for me since I plan on using Valentine candy and treats to hook my kids on collecting and organizing data! Last year we used conversation hearts to collect data. Students had to make towers and record how many hearts they could stack before they fell over. Then as a class we tried to pull all of our data together and think of a way to display it. It was a really fun was to get started on data collection instead of just using survey questions. Here is a picture from last year and here is the post. We also did an activity in which I hid 100 chocolate kisses in the classroom. Students had to find the kisses and we recorded how many each student found and then we worked on organizing hat data as well. We also focus on making statements based on the data - leading us towards mean, median, mode and range. This year I will be doing each of these activities only I will try to change them up a bit as I have some of the same students. I am still thinking on that though!! Here is a freebie I shared last year just in case you want to check it out. I have not seen this book and I thought if seen most of this series! Too cute! Have fun hiding your treats!! Have a great week!!! We are starting our data unit this Thursday too! Great timing on the book!